Gram Pradhans and other public representatives in the district have demanded that Champawat should be declared as drought affected district as due to lack of rain, farmers have lost their 50 per cent crops. 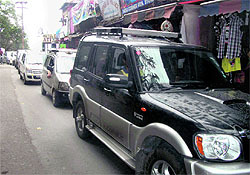 The tourists arriving in Mussoorie are facing the problem of inadequate parking space and mismanagement by the local administration during the peak season. Chairperson of the Rural Litigation and Entitlement Kendra (RLEK) Avdhash Kaushal, in a letter to Prime Minister Manmohan Singh, has urged him to order the restarting of the stalled hydropower projects on which 50 per cent of the work had already been undertaken. Bank employees under the aegis of the United Forum of Bank Unions held a demonstration against the alleged discriminatory policies of the Centre regarding the banking sector in the country. Dehradun, June 27 Carelessness on the part of Yogender Mittal, a shopkeeper at Babu Garh in Vikasnagar, cost him his life last night. Yogender and his wife were sleeping in their house without bolting the main door. Three thieves entered the house at night and clubbed Yogender to death. It was around midnight when Yogender and his wife Neelam Mittal were sleeping that three thieves entered their house and put a bed-sheet on Neelam’s face. Pithoragarh, June 27 A woman was injured in a leopard attack at Nayal Maphi village, 30 km from Bageshwar district headquarters, yesterday, said forest officials. Mussoorie, June 27 Three persons were injured while five other escaped with minor injuries when the car they were travelling in overturned near Kempty Falls today. With each passing year the problem of shortage of doctors continues to grow and experts blame poor service conditions being offered by the state government as a major reason for the shortage of trained manpower in the hills. The first batch of 47 pilgrims of Kailash Mansarowar reached New Delhi today after completing the pilgrimage. The first batch returned at the base camp of Dharchula on June 25, after completing their journey, and set for New Delhi the next day via Pithoragarh, said BR Arya, in charge base camp. To encourage industrial development in the hill areas of the state, the Uttarakhand government is expected to make a strong case for financial assistance from the Planning Commission during the annual plan finalisation meeting to be held on July 3 in New Delhi. The stalling of three hydro-power projects by the Centre on the Ganga and its tributaries in Uttarakhand has sparked off a war of words among groups on both sides of the spectrum. Furkan Ahmed, Secretary, Minority Welfare and Industrial Development Department, reviewed various schemes meant for minority communities at a meeting held in the city today. Members of the Indira Nagar Yuva Sangathan today staged a protest on the premises of the Dehradun Municipal Corporation (DMC), demanding proper power supply and laying of sewer pipes in Indira Nagar. A comprehensive and detailed meeting to discuss anti-poaching measures in the wake of reports of entry of poachers into the Corbett Tiger Reserve was held at Kalagarh yesterday. ‘Kalptaru’, a book having compilation of essays and poems written by Tika Ram Maithani, was released at a function here today. Paripoornanand Painauli, a former Lok Sabha member, along with several other prominent Hindi literary personalities. “Not only the crops of rabi and kharif have been destroyed by the drought-like conditions in the district, but the cash crop of potato and local seasonal vegetables have also been destroyed, ” said Prakash Mahra, president, Gram Pradhan Sangathan, Champawat. “The dry condition in the district has also created the crisis of fodder for cattle which has resulted into reduced production of milk in the district,” said Mahra. The newly appointed vice-chairman of the State Cooperative Board Kushal Singh Adhikari in a separate letter sent to the Chief Minister said the parameters of drought relief given by the state to drought affected farmers should be changed and the drought-hit farmers be given free foodgrains. “The existing parameters of drought relief are based on old prices and are not sufficient enough to give a single-day relief to a family of villagers whose crops have damaged,” said Adhikari. Congress MLA from Champawat Hemesh Kharkwal has assured the farmers that the district administration will start surveying the damaged crops of potato and local vegetables within a week. “As farmers have claimed a loss of more than 80 per cent of potato crop, the government will be requested to waive the agricultural loans taken for this crop,” said the MLA. According to local Horticultural Department sources, due to less winter rain this year, the potato farmers have sown potato in less area in the district. Even that crop has been damaged by deficient pre-monsoon rain. “Whereas the farmers have sown potato in 2977 hectares of land last year, the sowing areas has been reduced to 1900 hectares this year due to these adverse weather conditions,” said SS Jatav, horticulture inspector at Horticulture Office, Champawat. The tourists arriving in Mussoorie are facing the problem of inadequate parking space and mismanagement by the local administration during the peak season. The tourists were seen stranded for several hours in long queues of the vehicles while entering Mussoorie today. Kamal, a tourist from Delhi, who waited for the vehicles to move for half an hour, said he expected a well managed town. To his disappointment, he witnessed traffic congestion even on Mall Road. “It is better to stay back home than come to Mussoorie,” he added. Ramesh, a resident, was of the view that lack of coordination among various government departments had led to such situation in Mussoorie. He said earlier Mall Road was only for pedestrians but with the installation of barriers at both sides of the road, the Municipal Council had levied Rs 100 entry tax. The tourists do not mind paying the amount, thus resulting in an increase in vehicular movement and frequent traffic jams. Municipal Council president OP Uniyal opined that the town’s basic amenities had not grown in proportion of the inflow of tourists. He has been harping on the initiation of the widening of the roads in the town to ease the traffic flow but to no avail. He also said the officials were not interested in solving the problems that would become bane of the town in near future. Chairperson of the Rural Litigation and Entitlement Kendra (RLEK) Avdhash Kaushal, in a letter to Prime Minister Manmohan Singh, has urged him to order the restarting of the stalled hydropower projects on which 50 per cent of the work had already been undertaken. He also requested him to reconstitute the Ganga River Basin Authority. The RLEK is a voluntary organisation spearheading an agitation for the restart of hydroelectric projects in Uttarakhand. Kaushal said it was a genuine demand and aspiration of the people of the state that hydroelectric projects be started. “You may ascertain this demand by your intelligence agencies,” he wrote in the letter. He further wrote environment-friendly hydropower projects, including state-owned Palamaneri (480 MW) and Baironghati (381 MW) projects and the Centre-owned Lohari Nagpala (600 MW) project which were only tunnel-based and run-off river type of projects, had been stopped by the Centre “bowing” to political and religious pressures. This had resulted in great suffering not only to Uttarakhand but the entire northern India, including Delhi. These projects were ready to generate electricity by 2011-12. The Srinagar hydropower project (330 MW), which is 80 per cent complete and also faces closure, would have started producing electricity in 2012-13. In total, these power projects would produce more than the required electricity and would have led to reduction in power cuts in Uttarakhand and even neighbouring Delhi, he claimed. “Uttarakhand is suffering an energy crisis at a time when it has the potential of generating 40,000 MW from its water resources alone. It is sad that the state could produce only 11,381 MW at present. The state, which has proper development of hill regions as one of the main reasons for its creation, has to source power from other states to meet the power deficit,” he said. The state government has made an effort to bridge the gap in demand and supply of electricity by undertaking work on 70 hydropower projects on the Ganga and its tributaries. However, protests by anti-power project activists have put Rs 30,000 crore projects in danger besides unemployment for thousands of people engaged in these projects. Now GD Agarwal, Rajinder Singh and Uma Bharti are ascertaining that a small Dhari Devi temple near Srinagar will be submerged while it is being lifted entirely and put at the bank of the Ganga after spending crores of rupees. Dhari Devi Temple is a local temple and the priests as well as local people have also given their consent to lift it. “The argument put forth by the opponents of the projects of pollution of the Ganga and its tributaries due to power projects does not hold any scientific logic. The production of hydro electricity does not consume one single drop of water as it falls on the turbine and again joins the mainstream of the Ganga,” he said. “I request you to kindly either scrap the Ganga Basin Authority or reconstitute it so that the Ganga Basin River Authority may take balanced decisions,” Kaushal said. The employees and officials gathered at the Meedo Plaza complex and held a public meeting, where bank employee leaders criticised the government for exploiting the employees in the name of reforms. They raised slogans against the policies of the Union government. Jagmohan Mehndiratta, state secretary of the All-India Bank Employees Association (AIBEA), alleged that the government had been trying to infiltrate big business houses in the banking sector in the name of reforms. He said allowing foreign and Indian business houses to open banks and giving them voting rights in the boards of public sector banks were part of the same conspiracy. He charged that the government planned to close down rural banks that were not profitable and replace them with business correspondent and ultra-small branch banking, which was another ploy to bring in the private sector into banking. He said bank employees would strike work on July 25 and 26 on a call given by the United Forum of Bank Unions. Carelessness on the part of Yogender Mittal, a shopkeeper at Babu Garh in Vikasnagar, cost him his life last night. Yogender and his wife were sleeping in their house without bolting the main door. Three thieves entered the house at night and clubbed Yogender to death. It was around midnight when Yogender and his wife Neelam Mittal were sleeping that three thieves entered their house and put a bed-sheet on Neelam’s face. They then thrashed Yogender with a wooden log used to wash clothes. When Neelam tried to resist, they also beat her up, forcing her to keep silence. Meanwhile, the thieves continued to thrash Yogender. They then opened a cupboard with a key hanging from its keyhole. They took away jewellery and cash. After the thieves left, Neelam called out to Yogender’s nephew Piyush Mittal, who reached there and took Yogender to a local hospital. But a lot of precious time was lost by then and Yogender was declared brought dead by doctors at the hospital. The police was informed about the incident around 2 am. Neelam was shell-shocked and was not able to reveal much about the incident. It seemed more of a murder then a case of theft to the police. A woman was injured in a leopard attack at Nayal Maphi village, 30 km from Bageshwar district headquarters, yesterday, said forest officials. The woman, Revati Devi (38), of the village, was attacked by the leopard when she had gone to collect fodder for her cattle at a store near her house. The animal attacked the woman, injuring her in face and arms. Three persons were injured while five other escaped with minor injuries when the car they were travelling in overturned near Kempty Falls today. More than 10 years after the creation of the state, the medical facilities set up in the districts of Pauri and Uttarkashi continue to be without doctors. Against the total of 2,430 sanctioned posts of doctor, 1,081 are occupied, which is 44.5 per cent, while against 1,112 sanctioned posts of specialist doctor, only 373 are occupied. Similarly, against 145 sanctioned posts of gynaecologist, only 62 are occupied. On the other hand, against 112 sanctioned posts of 112 radiologist, 31 are occupied while against 127 posts of anaesthetist 40 are occupied. While against 156 sanctioned posts of surgeon, 40 are working, and against 129 posts of physician, 34 are occupied. Doctors are being forced to seek careers in the private sector due to poor salaries. “The problem in the hills is acute because the candidates are not keen to go to the hills. We are taking all steps to fill the vacant posts by organising regular walk-in interviews,” said Dr JP Bhatt, Director-General, Family Health and Welfare. Allowances for remote postings (inaccessible areas in the hills is Rs 2000, and for extreme inaccessible areas Rs 3000) offered by the state government have failed to attract doctors. “At the entry level, an MBBS receives Rs 45,000 if he opts for state service; it is just not possible to make both ends meet with this kind of monthly salary,” said Dr BC Ramola, president, Provincial Medical Health Services, Uttarakhand. Experts say the doctors joining 2005 onwards will also not receive pension, and even gratuity and contribution under provident fund have been made optional. These extreme steps have made the government medical services unattractive. The first batch of 47 pilgrims of Kailash Mansarowar reached New Delhi today after completing the pilgrimage. The first batch returned at the base camp of Dharchula on June 25, after completing their journey, and set for New Delhi the next day via Pithoragarh, said BR Arya, in charge base camp. “The pilgrims complained of lack of sanitary arrangements and Indian food in the camps in Tibet and pleaded to depute a team of doctors at every camp in the higher altitude,” said Bachi Ram Arya, in-charge of the base camp, quoting liaison officer of the first batch Kunwar Pal Singh. According to the base camp in charge, while the first batch has reached New Delhi, the second and third batches are inside Tibet on their pilgrimage and the fourth batch of Kailash Mansarowar pilgrims will cross into Tibet on Thursday while the fifth batch of 53 pilgrims, reached base camp today. After the plain areas of the state benefited from the concessional industrial package that has now been withdrawn, the government is keen to replicate the similar experiment in the hilly areas that have been untouched by the industrial boom. “There is rampant unemployment in the hilly areas of the state and even after the creation of a separate state, the problem on unemployment among the youth continues. We would be presenting a proposal before the Deputy Chairman of the Planning Commission for seeking some kind of assistance from the government,” said senior officer in the Industries Department. Since the Congress government came to power in the state, there have been hopes that the Congress-led UPA government would try to compensate the Uttarakhand government by giving some sort of financial assistance to the state for initiating industrial development in the state. “As the concessional package was withdrawn by the Congress-led UPA government when the BJP government was in power in the state, one could understand the political constraints, but now the situation is different and some sort of package for initiating development in the hilly areas of the state should not be difficult in coming,” said a top bureaucrat. The Planning Department has pegged the draft annual plan at Rs 8212.60 crore for 2012-2013, subject to the approval by the Planning Commission of India. The draft plan envisages a jump of Rs 412 crore from last year when the total plan outlay for 2011-2012 was Rs 7,800 crore, a staggering increase of Rs 1,000 crore from (2010-2011). Avdhash Kaushal, who has been protesting against stopping of the work on the hydro power projects “in the name of protecting environment”, today wrote to Prime Minister Manmohan Singh, requesting him to either scrap or reconstitute the National Ganga Basin River Authority (NGBRA) of which the PM is the chairperson. “Rajinder (Rajendra) Singh, GD Aggarwal etc, after losing in the High Court, manipulated their entry into the Ganga River Basin Authority…” he alleged. His charges that “a majority of the special invitees on the panel were acting as opponents to development activities on rivers of power-starved Uttrakhand” drew sharp words from those on the target. Talking to The Tribune, NGBRA member Rajendra Singh rejected the allegations as “baseless” and asked Kaushal to first ascertain the facts. “He (Kaushal) does not know what he is talking about. GD Aggarwal is neither a member of the NGBRA nor has he ever attended a meeting. Also there are cheaper, better ways to generate electricity like solar and wind energy. Maybe he does not know that renewable energy sources are better for environment as compared to hydel projects,” Singh said. Incidentally, Singh is one of the three NGBRA members who, in March, resigned from the high-profile panel citing the PM’s complete lack of interest and inability on saving the Ganga as the reason. The group took back the resignation after a meeting was convened but the open letter by three members — Ravi Chopra, Rajendra Singh and Prof R H Siddiqui — was categoric on how, even after three years since its formation, the authority had failed to achieve an thing. But the present tussle is Uttarakhand-specific. Around two years back, the Centre had stopped the construction of Pala Maneri, Bhaironghati and Lohari Nagpala projects on the Bhagirathi river, the schemes which would have been generated electricity not just for the state but also for other parts of North India. It was decided at the meeting that a Madarasa Board Act be enacted, salaries to selected teachers be disbursed under various schemes, strict action be taken against the CEO of the Uttarakhand Wakf Board for canceling the appointment of a manager of Kaliyar Sharief, staff be appointed under the 15-point programme, a high-level inquiry be constituted into the grant of benefits under the Sixth Pay Commission without creating posts in the Wakf Board and construction of buildings in areas inhabited by the minority community under the Central government schemes. Gaurav Kumar, a resident, said due to insufficient number of streetlights, their area plunged into darkness at night. It had become very difficult to go out of the houses at night. Many accidents have also been reported in the area. Another resident, Praveen Rawat, said voltage fluctuation had damaged many electronic equipment in their house. The matter was also put forth before the Power Department but nothing had been done so far. Sewage pipes that had been laid long ago had also damaged at many places. The members also submitted a memorandum to Mayor Vinod Chamoli, who has given them an assurance to look into the issues. Brijendra Singh, honorary warden of the Corbett Tiger Reserve, who is also a member of the National Tiger Protection Authority and National Wildlife Board, along with senior officials of the state Forest Department, including SS Sharma, Uttarakhand Chief Wlidlife Warden, and Director of the Jim Corbett National Park Ranjan Misra attended the meeting. All eleven range officials of the Corbett Tiger Reserve were also present. The officials presented their contingency plans and problems faced by the staff during monsoon. They requested that the funds meant for the patrolling staff should be disbursed by the state government without any further delay. Other field problems such as lack of vehicles and fuel availability were discussed in the meeting. It was emphasised that patrolling as well as intelligence initiatives should be strengthened.